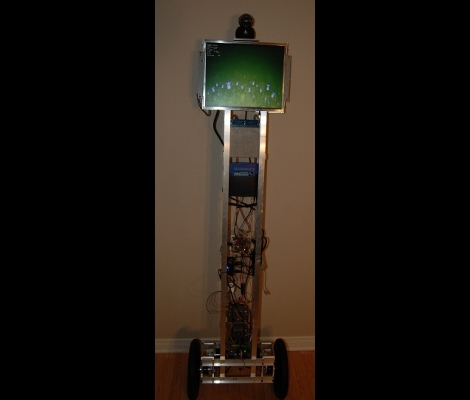 Meet TIPI, the Telepresence Interface by Pendulum Inversion. TIPI is something of a surrogate, giving physical presence to telecommuters by balancing an LCD screen and camera atop its six foot frame. The user has full control of the robot’s movement, with their own camera image shown on the display so that others interacting with the bot will with whom they are conversing. 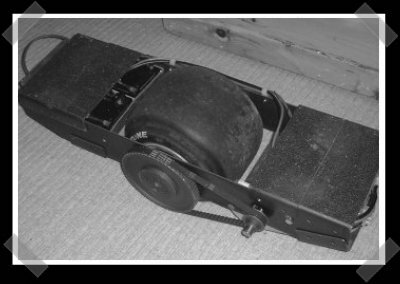 A pair of 12.5″ wheels connec to DC motors via a gear box with a 37:1 ratio. These specs are necessary to recover from a sudden 20 degree loss of equilibrium, quite impressive for a bot of this stature. An Orangutan SVP board monitors a two-axis accelerometer and a gyroscope for accurate positioning data. This board automatically keeps balance, while taking user commands from a second control, a Beagle Board. The Beagle Board handles the communications, including sending and receiving the video signals, and delivering incoming position control data to the Orangutan. Separating the two systems guards against a screen-shattering fall by making sure the hardware likely to face slow-down or lockup is physically separate from that responsible for balance. Check out the video clip after the brake to see some balancing goodness. It shouldn’t be hard to build your own version for much less than the $15k price tag enjoyed by some commercial versions.